Recently-retired pacer Ultimate Machete has been purchased for stallion duties in a partnership deal between two New Zealand stud farms. South Auckland’s Alabar Stud and Christchurch’s Nevele R Stud have acquired the son of Bettor’s Delight after he was retired from racing through injury last month. Ultimate Machete was voted both the Three and Four-Year-Old Male Pacer of the Year in the past two seasons off the back of a brilliant Sires Stakes win at three and three straight Group 1 wins as a four-year-old, including two in Perth. The most memorable, of course, was his brilliant effort to sit parked outside Tiger Tara and win in the New Zealand Free-For-All in New Zealand record time in November of 2017. 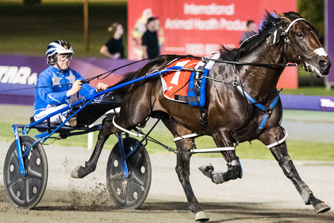 Mark Purdon co-trained Ultimate Machete throughout his career and he is full of admiration for what the horse achieved in what was ultimately an injury-shortened career. “He was a very tough horse with a great attitude. He never gave in, always trying right to the wire. Most will have forgotten, too, that Ultimate Machete was the favourite for this season’s New Zealand Cup before a minor hoof issue become apparent ten days before the great race, forcing his scratching. And while his deeds on the track were relatively short-lived, his bloodlines will remain prominent through his younger brother, Ultimate Sniper, who has this year’s Three-Year-Old of the Year crown sewn up. Ultimate Machete will stand officially at Alabar’s Waiau Pa property at an introductory service fee of $3000 (plus GST) in New Zealand and $3000 (incl GST) in Australia.